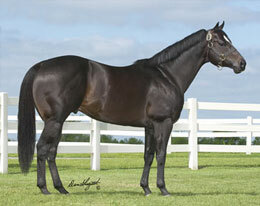 Multiple stakes sire Ivory James sired five stakes qualifiers over the April 7 thru 9 weekend. WAYNE, OK�APRIL 8, 2017�Over the April 7 thru 9 weekend, Royal Vista Ranches' IVORY JAMES sired five stakes qualifiers to various races in Oklahoma, Texas and Arizona. In addition to the $1,320,400 Remington Park Oklahoma-Bred Futurity(RG2) and the $483,600 Sam Houston Futurity(G2) (see related stories on the this website) he also sired qualifiers to the Remington Park Juvenile and the John Deere Turf Paradise Juvenile. In the $100,000 Remington Park Juvenile Invitational to be contested April 22nd at Remington Park, Streaks Of Ivory picked up a starting spot by clocking a :17.115 time no the first night of the $1,320,400 Remington Park Oklahoma-Bred Futurity(RG2). Trainer Terry McLean saddled the IVORY JAMES filly to the 9th fastest time from 102 state-bred juveniles who raced in the first night of qualifying trials. Gerry McLean owns the Michael Teel-bred out of StreakinRare by Fredricksburg. The complete list of preferred invites to the $100,000 Remington Juvenile Invitational. CLICK HERE. On Saturday, Pure Ivory finished second in the final trial for the $25,000-added John Deere Turf Paradise Juvenile at Turf Paradise. Ridden by jockey Armando Cervantes, the IVORY JAMES 2-year-old record the fourth fastest time of :18.380 seconds. Leonard Espinosa trains the gelding for owner Rigoberto Guillen. Harvey and Brenda Pickens bred Pure Ivory in Idaho from the First Down Dash mare First Down Destiny. The John Deere Turf Paradise Juvenile Challenge final will be contested on Sunday, April 30th.